Ctrl Space were engaged by Skycity Hamilton to create an authentic Spanish tapas eatery at the heart of the new City Co-Op in Hamilton. The concept was inspired and driven by the chef - it was important the interior captivated the same passion and authenticity as the food on offer. A mix of social dining, intimate occasions and a private dining room to host the desirable long lunch was required. The objective was to design a space that allowed Skycity to showcase a level of hospitality to the high expectations of today’s market. The interior was to encompass an open kitchen and wine bar to celebrate the food and wine culture of Spain. 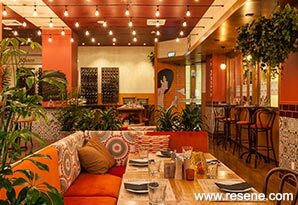 Through considered spatial planning and intimate seating arrangements Ctrl Space established an eclectic arrangement of furniture that created the ideal dynamic for a theatrical tapas environment. With budget in mind, the essence of Spanish street food culture was adopted, which was brought to life in the interior to a level of authenticity that matches the passion and vision of the chef. 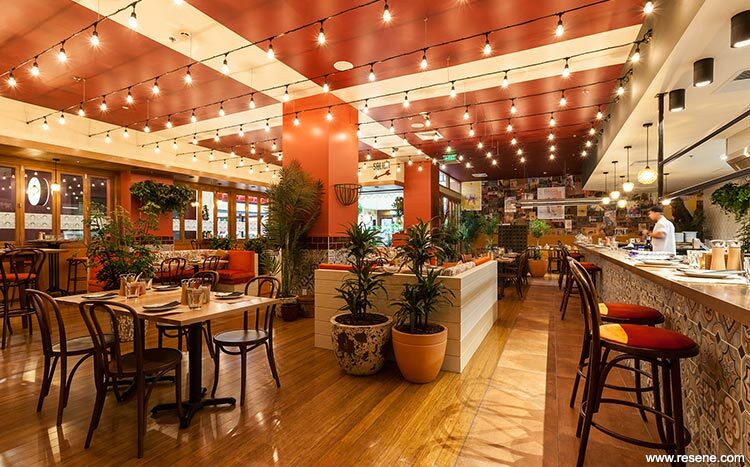 Simple paint effects create a bold ceiling feature that sits above a canopy of dense horizontally strung party lights, creating a night sky theatrical feeling within the restaurant. 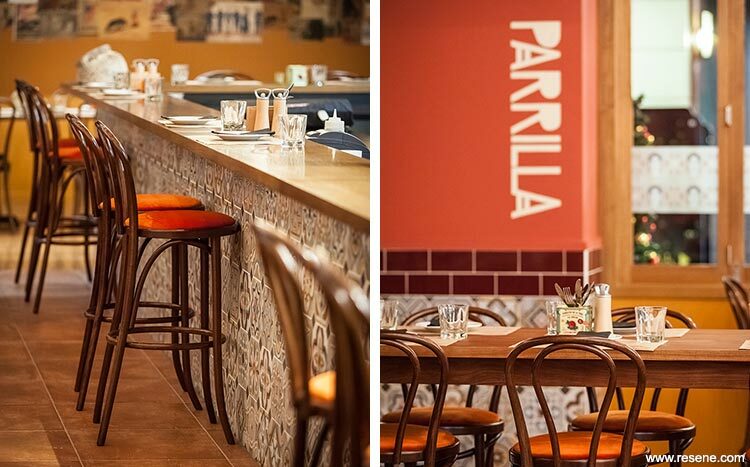 Spanish style tiles line the main food and beverage counters to highlight these elements. Bespoke L shaped banquette seats with a selection of Spanish inspired fabrics created four social dining areas within the restaurant. Traditional hand painted Spanish signage was executed throughout the interior in contrast to the contemporary neon Spanish signs that occupied the wine bar. Simplicity was used within the paintwork to host a curated layer of styling elements that created a Spanish celebration. Delicate light selections were designed to give certain areas a domestic feel and level of familiarity. The walls are finished in Resene Sandtex mediterranean effect tinted to Resene Double Spanish White, with Resene Zylone Sheen tinted to Resene Moroccan Spice of the lower half of the walls, a colour also repeated on the eyebrow and feature timber slatted ceiling. Columns are finished in Resene Cha Cha, featured slatted wing walls in Resene Lustacryl semi-gloss waterborne enamel tinted to Resene Madam M and the kitchen bulkhead front face in Resene SpaceCote Flat in Resene Karaka. The ceilings evolve from Resene Quarter Spanish White in the kitchen, to Resene Spanish White on the ceiling feature cross to the feature colour of Resene Madam M.
Collaborating with a local artisan to bring the private dining room to life, a street style poster wall adds a genuine energy to the room. Layers of Spanish inspired vintage advertising posters were installed in a collage manner that filled the entire private dining room back wall. Reinstating vintage French Champagne racks to create back bar wine storage provided a rustic contrast alongside the bold Resene Moroccan spice painted walls. Vintage A-frame wine racks and Atlantis pot plants acted as spatial dividers keeping the space zoned while retaining an open feel.